The Digital Methods Initiative (DMI), Amsterdam, is pleased to announce its 6th annual Winter School, entitled "My Sentiments Exactly: On Methods of Early Warning, Detection and Monitoring through Online and Social Media." The Digital Methods Winter School provides the opportunity for PhD candidates, advanced MA students and motivated scholars to work on timely research methods as well as present a short paper on digital methods and new media related topics, with feedback from the Amsterdam group of DMI researchers and international participants, often drawn from previous Digital Methods Summer and Winter Schools. This year's Winter School is five days, with one day devoted to the Mini-conference, where the papers are presented and participants also serve as respondents, and four days to the workshop. (Participants do not have to present a paper to take part in the workshop.) The theme of the workshop is "methods of early warning," and includes a data sprint. This year's edition will feature, among other interventions, guest lectures by eminent scholars and practitioners, including Mike Thelwall from the University of Wolverhampton, one of the developers of SentiStrength, the sentiment analysis software program. We also will be joined by Cornelius Puschmann of the Humboldt Institute for Internet & Society (Berlin) and Wendy Chun of Brown University. Subject matter experts include Nick Lowles of the Hope not Hate campaign of London as well as Benjamin Ward of Human Rights Watch. In the workshop we will be using Netvizz as well as the Twitter Capture and Analysis Toolset (TCAT), both developed by the Digital Methods Initiative (Bernhard Rieder and Erik Borra). 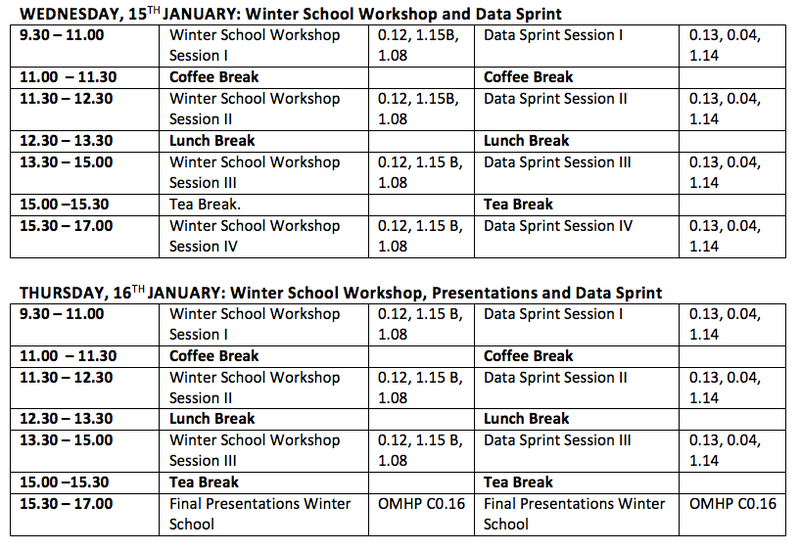 The 2014 Digital Methods Winter School is devoted to methods of early warning, detection and monitoring with social media data. Animal spirits in the stock market, the mood of the people before the elections, the buzz leading up to the Oscars, Emmys and Grammys - these are some of the common use cases, and for some analysts "data fantasies", put forward for deploying digital detection programs. Occasionally expressed as opportunities in big data, early warning systems and other societal monitoring devices using social media data are of interest as an alternative social research arena even competing with the more conventional social scientific instrumentarium. 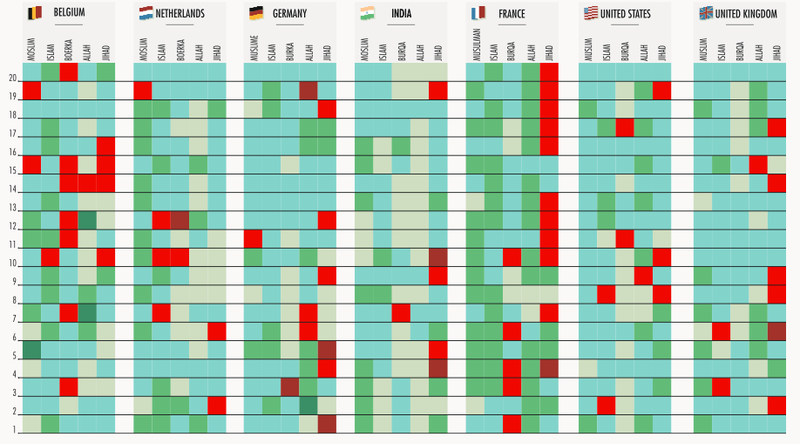 Google Flu Trends and Dengue Fever Trends signalled the use of engine queries to study incidence of ailment and its geography. The work using Twitter as anticipatory space has been less effective, perhaps summarised in the academic paper entitled, "I Wanted to Predict Elections with Twitter and all I got was this Lousy Paper." The 2014 Digital Methods Summer School takes stock but also applies software techniques to study resonance, salience as well as sentiment using online data. Where are the fruitful realms of application for such monitoring techniques? Are the techniques well suited to the comment and review spaces online? May we characterise hashtags as polemical, comical, highly substantive or nonsensical? How to geo-locate hate speech? Whilst disparate the list of questions seeks to invite application of monitoring software to wide-ranging online data sets, and experimentation. How to determine the spaces and derive metrics for unrest, collective nervousness, and other such constructions. May we derive signatures of affective states? Traditionally, victim studies have relied on two main sources of data: police reports and self-reporting. Another way to gather instances of hate violence is to conduct press monitoring. More recently, projects have attempted to crowd-source hate crime reports but with little success. This workshop aims to fill in the gaps of these traditional forms of gathering victimisation data by building an apparatus that uses Facebook and Twitter to monitor instances that may lead to hate violence. In doing so we ask: Is there a link between incitements of violence on social media and wider violence? How can we find social media hate activity measures that correlate with violence acts? Could social media give us early warning tool for hate violence? Extremist sympathiser networks, activists as well as victim spaces online will be monitored. An activity measure that will be explored on both Facebook and Twitter is the content (images, URLs, videos) that is most circulated and that animates particular groups. Another approach takes selected events at its core and investigates hate incitement activity around these events on social media retrospectively, and correlates these online activities with violent acts. 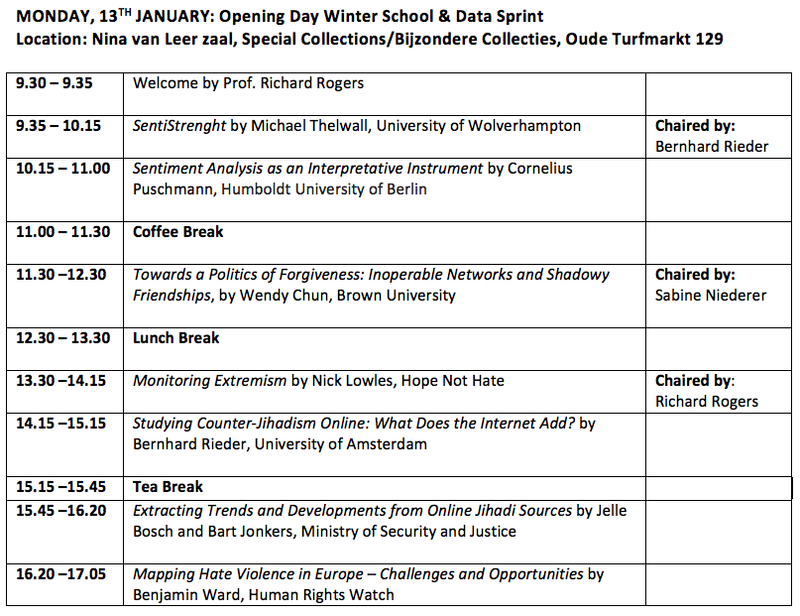 There is also the annual Digital Methods Winter School Mini-Conference. The mini-conference provides the opportunity for digital methods and allied researchers to present short yet complete papers (5,000-7,500 words) and serve as respondents, providing feedback. Often the work presented follows from previous Digital Methods Summer Schools. The mini-conference accepts papers in the general digital methods and allied areas: the hyperlink and other natively digital objects, the website as archived object, web historiographies, search engine critique, Google as globalizing machine, cross-spherical analysis and other approaches to comparative media studies, device cultures, national web studies, Wikipedia as cultural reference, the technicity of (networked) content, post-demographics, platform studies, crawling and scraping, graphing and clouding, and similar. Winter2014Project9 - Psycho-geographies of Amsterdam East. Further reading: "Rigor and flexibility in computer-based qualitative research: Introducing the Coding Analysis Toolkit"
How to get to/from Schiphol Airport? How to get to the University of Amsterdam from the Central Railway Station? Take tram 4, 9, 14, 16, 24 or 25 and disembark at Spui/Rokin, then walk to Oude Turfmarkt, enter through the passageway, and walk to the Media Studies building, Turfdraagsterpad 9. The Allard Pierson Museum is next to the entrance to the passageway. All other locations are a short walking distance. Winter School opening: Nina van Leer zaal, Special Collections/Bijzondere Collecties, Oude Turfmarkt 129. The festival closing is at the restaurant Kapitein Zeppos, located at Gebed Zonder End 5, Amsterdam. 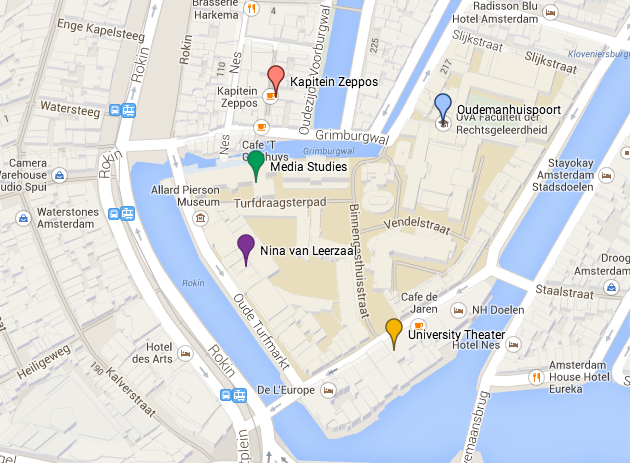 Also, there is a Google Map with all locations of the University of Amsterdam. Here is a guide to the Amsterdam new media scene. We will have an open Skype channel for all participants. The Digital Methods Winter School is part of the Digital Methods Initiative, Amsterdam, dedicated to reworking method for Internet-related research. The Digital Methods Initiative holds the annual Digital Methods Summer Schools (six to date), which are intensive and full time 2-week undertakings in the Summertime. The 2014 Summer School will take place 23 June - 4 July 2014. The coordinators of the Digital Methods Initiative are Sabine Niederer and Esther Weltevrede (PhD candidates in New Media & Digital Culture, University of Amsterdam), and the director is Richard Rogers, Professor of New Media & Digital Culture, University of Amsterdam. Digital methods are online at http://www.digitalmethods.net/. The DMI about page includes a substantive introduction, and also a list of Digital Methods people, with bios. DMI holds occasional Autumn and Spring workshops, such as Mapping Populism in Europe and Climate Change and Conflict.